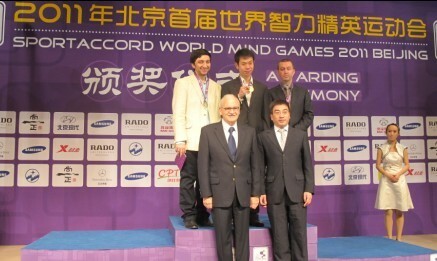 The number one Chinese GM Wang Hao gained the frist Gold medal here! We had the interview with him after his last game. —— Thanks a lot. I had played well in the first four games, but badly in the last three. It is quite common to blunder in rapid games as it is impossible to calculate all the variations thoroughly in the given time. The game was very complicated against Karjakin, where both sides missed the winning variations under time pressure. Under such conditions, it is possible for any player to win. I just happened to be the fortunate one. The last game was terrible. It was an easily drawn position, and I could not see any progress for both sides. Being overconfident about the result, I missed my opponent's counter-attack. After losing a pawn, I was unable to keep cool, and there was a point where my opponent could have won with Kb4. I saw it beforehand but thankfully, he had missed the winning move. After Kd4, the draw is inevitable. —— Is this tournament important to you? —— Winning this tournament was not very important for my career progression, but it is a good thing that my friends will be happy about. I prefer to play classic time control, as it is extremely tiring to play under such time pressure as rapid chess causies my heart beat to increase. —— How can you evaluate this year in general? —— Overall, my tournament results for this year are pretty average, though I have played well in the World Chess Team Championships, which I was also lucky in. But it was an enriching year with part of the time spent on studies, and another part making new friends. —— What's your hobby beside chess? —— I have a wide range of hobbies, including listening to music, reading, surfing the web, and jogging. —— So，Wang Hao, do you have girl friend? —— I am currently single. A good mood is the most important for me to date with girls. I can say that everyone likes beautiful girls including me, but I found confident and assertive women attractive. —— What's your goal of next year? —— The goal of next year? I don't know any tournament schedule yet. But generally I wish I will have a wonderful life as everything is going smoothly, with both chess and studies.